The inaugural National Awards for Disability Leadership celebrated the achievements of people with disability yesterday on the International Day of People with Disability. 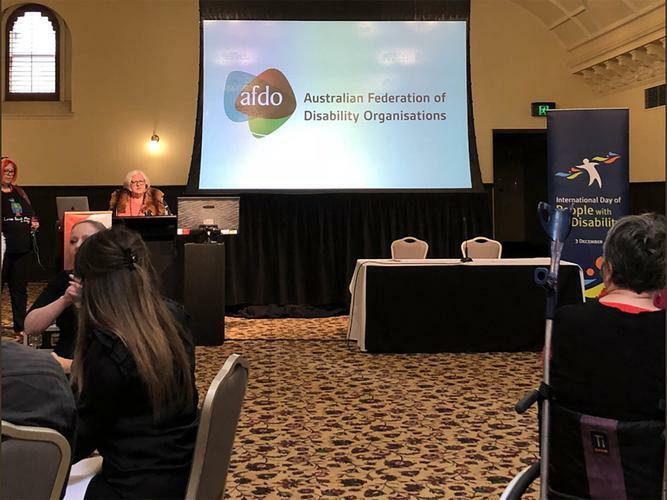 The awards were brought to life through a collaboration between the Disability Leadership Institute, Australian Federation of Disability Organisations (AFDO) and Disabled People’s Organisations Australia (DPOA). Divided into seven categories, the winners included Janice Slattery (Lesley Hall), Sarah Houbolt (The Arts), Anthony Mulholland (Change Making), The LGBTIQ inclusion project within the Sexual Lives and Respectful Relationships (SL&RR) program at Deakin University (Inclusion), Client Voice Project Group (TAC) - David Cook, Nathan Clark, Jessica Parson, Emma Simpson, Toni Sheedy, Thomas Norwood and Eva Sifis (Innovation), Rosemary Kayess (Rights Activism) and Jessica Walton (Social Impact). Sue Salthouse, winner of last year’s Lesley Hall Lifetime Achievement Award highlights the importance of recognising the achievements within the disability community, with the three aforementioned disability organisations organising the event after the National Disability Awards were discontinued last year. “People with disability have come together to celebrate the strong expertise and talent of our community in our National Awards, run by people with disability, for people with disability,” she says. Ms Salthouse presented this year’s highly acclaimed award to Janice Slattery who has advocated for people with intellectual disability for over three decades. “She has made an outstanding commitment to the disability rights movement over decades that has resulted in substantial change for people with disability. Janice has inspired younger leaders, in particular many women with an intellectual disability in her work in women’s health, sexuality and violence and abuse prevention, showing them how it is done,” Ms Salthouse says. Chief Executive Officer of the Disability Leadership Institute, Christina Ryan congratulated the well-deserving winners of the Rights Activism and Change Making categories. “Rosemary Kayess is such a worthy winner of the Rights Activism award, for her work as an internationally respected lawyer, academic and researcher specialising in discrimination and human rights law,” he says. Upon receiving her award, Rosemary thanked everyone in the disability advocacy space. "To everyone out there - all the work you do makes my work much easier. Without all that fabulous activism and advocacy, I have nothing to work with. Thank you for all you do,” she says. Board member of AFDO, Frank Hall-Bentick describes the disability arts sector as ‘dynamic, innovative and pioneering’. “People with disability are natural innovators, as we move around a world not designed for us,” he says. President of People with Disability Australia for DPOA, Dr David Abello describes the importance of the awards in encouraging future change through leadership. “These awards reflect what is important to disabled people, to our movement and to the ways that we are driving change and pursuing equality for our community,” he says. The awards were held at the Melbourne Town Hall but were also watched via a live webcast, with organisations and individuals taking to social media to pass on their congratulations. Thank you to all involved in making the #DisabilityAwards2018 happen. We know a lot goes on behind the scenes. Congratulations to all the nominees and winners. We're looking forward to next year! Happy #IDPWD2018 to all,” First Peoples Disability Network Australia says. “What an awesome group of disability leaders. Thanks to @DisabilityLead, our @DPOAustralia colleagues and @AfdoOffice for presenting these important awards,” Women with Disabilities Australia tweeted.